Likes on your posts is an easy way to see how engaged your Instagram followers are. But what if those likes are fake? No matter if you’re an influencer or a business, likes are an important symbol of how engaged your audience is. In Instagram’s early days, follower count was everything that counted (pun intended), but that’s not the case anymore. 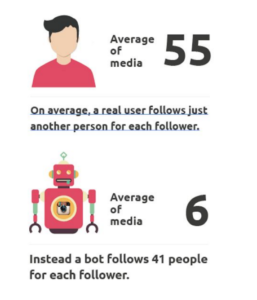 As buying fake followers is as easy as ABC, more people are now comparing the followers with the likes of a page to see the page’s true popularity. This goes for both brands and influencers. If a brand sees an influencer with a huge following but with few likes, chances are, they’ll run the other way. The brands want to see real numbers to how many they’re actually reaching and impacting. On Instagram, likes are an easy way to do just that. Likes works as a symbol of popularity. If a brand have lots of followers, but only a few likes on each post, they’ll be conceived as a brand that nobody really cares about. By buying fake Instagram likes, you can fake your popularity, present it as more popular, and therefore also attract more real people. On the surface, buying fake likes on Instagram seems like a quick and simple way to boost your popularity – at least by the looks of it. Why wouldn’t you buy it? Unfortunately, everything that seems too good to be true often is. Fake likes on Instagram is no different. There’s more to it than the benefit of boosting your brand’s popularity on the surface. There are actually many dark sides to buying fake Instagram likes. In this article, we’ll dig deep into the 4 Reasons You Should Never Buy Fake Instagram Likes and how you can spot if someone do. First off, let’s begin by fully understanding what fake followers on Instagram really are. Because chances are, you’re here because you’re thinking about buying them, but want to get the full story apart from all the benefits that the companies who sell them present. If you aren’t here for that reason, don’t worry. Fake likes are a subject that is relevant to all Instagram users. Before we begin, let’s sort something out. There’s no such thing as “Real likes” when you buy fake likes. Either they’re fake or they are real. And if they’re real, they’re not bought. The reason to why the likes you purchase on Instagram is fake is simple. The services who sell them create thousands of fake Instagram accounts and use them to like your posts! We’ve already scraped on the surface to the reasons why people buy fake followers. As more and more people have started to buy fake followers, likes are needed in order to validate the popularity the follower count resembles. Due to the fact that influencers can make up to several hundred thousand dollars per marketing post on Instagram, it has tempted plenty of people to take the easy route and buy their followers. But as you know, when you buy fake followers, you’re just increasing your follower count and nothing else. Your engagement rate will be stuck at what ever level you started at. No matter if you buy 1000 or 10000 likes. They won’t really engage with your posts! Because let’s face it: fake accounts aren’t real people! Here’s where fake likes comes in. As more brands have realised that buying fake followers is becoming increasingly popular – especially among “influencers”, they’ve gotten more cautious with who they partner with. Because the truth is: by partnering with influencers who have no real influence over people, won’t generate any results. This is why likes has become such a vital part in identifying influencers who really matter and those who have an engaged audience who trusts and listens to what they have to say. And, as mentioned earlier, those influencers with a low engagement rate will be filtered out immediately. To prevent this from happening – whether you’ve bought fake followers or just have an audience that isn’t engaged with your posts, buying fake likes have become an easy solution to look more influential. Popularity is one of the most important reasons to why people are buying fake followers. By instantly boosting your Instagram post’s popularity with likes, you’ll come off as more popular and more trustworthy. Who doesn’t want to be more popular? Because if several hundred – or even thousand people trust you already, why shouldn’t new customers, too? I was contemplating whether or not I should include this part in the article, because frankly, I despise fake likes. Simply because I know how harmful they are. But then I realised that educating you about all the different aspects of buying fake likes on Instagram will help you grasp the subject better. However, what I will do is stick to the short version because we don’t need to be experts in how you buy fake followers. We just need to know why we shouldn’t buy fake likes – because then we won’t have any interest in buying them. A simple search on Google for “Buy Instagram Likes” will give us about 49 300 000 results. This just goes to show how widespread this issue is. At first glance, it might seem cheap, but I’ll explain why it’s really not, further on. Now that we got that sorted, let’s dig into the real subject. Bear with me, because this is about to get interesting! Whether you believe it or not, people will be able to tell that you buy fake likes. No matter how convincing the services that provide fake likes are. I come across people with fake followers on Instagram all the time. Most of them aren’t buying fake likes, and these accounts are so easy to call out that it’s silly. 200K followers and 100 likes per post. While those who also buy fake likes tend to be even easy to call out, if done “correctly”, it can be a little trickier to spot them. That is not to say people won’t be able to see it. On Instagram, the engagement tends to drop as follower count increase. 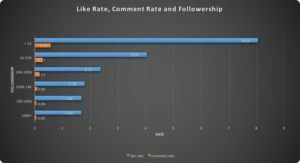 Take a look at this chart that describes the correlation between likes, comments, and followers, and how they change in accordance with the follower count. What’s interesting is that the accounts that purchase fake likes tend to buy far more likes than the average account receives to further boost their popularity. If you see an account that well and beyond exceed the average like rate respective to their followings, chances are, they’ve bought fake likes. Another giveaway is the number of comments compared to likes. If the like rate far exceeds the number of comments, it’s a clear sign that the account has bought fake followers. I often come across accounts with several thousand likes on each post, but only has two or three comments, and when I do, I can quickly conclude they’re faking their popularity. And yes, that is correct. This means that you won’t be able to tell if an account really buys fake followers by only looking at the number of comments. To sort them out of the equation and call them fake, you need to look at the comments in detail. The thing with fake comments is that they’re done by bots. This means that the bot don’t actually know what type of post they’re commenting on. Thankfully, spotting fake comments isn’t difficult either. 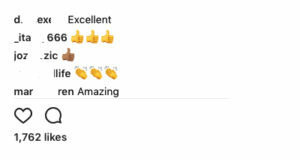 The comment is very generic such as “Nice post”, “Awesome” “Love it” and so on. In other words, comments that the owner of the account wants to hear. They’re made by fake accounts. (Identifying a fake account can be done in a heartbeat). Does the account follow any like/follower/comment selling service account? The number of likes is far higher than the average engagement. The likes are made by fake accounts. The account has a similar number of likes on al their posts. They have too few comments relative to their likes. As you may know, Instagram is tough on accounts that purchase fake followers, fake likes, or fake comments, and they will take action if they catch you doing it. Most of the time, they’ll ban your account without any notice. Think about it. Is it worth getting your account banned because you wanted a few extra likes on your post? Even if you choose the quick way of getting “fame”, you’ve probably spent some time building your account. Due to Instagram’s hard work with detecting and preventing spam, it’s only a matter a time before they do. It’s not a question if. Since spam became a big issue for Instagram, they’ve put tons of resources into preventing it in order to make the platform more authentic. Instagram has banned millions of spam accounts since they proactively started working against spam, and the biggest raid against fake accounts in Instagram’s history was made in 2014. Many celebrities lost millions of followers in a matter of hours, and Instagram’s own account lost 18,880,211 followers overnight. This just goes to show how powerful Instagram’s anti-bot detecting tools are and how they’ll catch you if you start buying likes. This is relevant both for influencers and brands. Fake likes won’t lead to more sales for brands, and they won’t lead to more partnerships for influencers. Fake likes are only creating a perception of popularity, but this does by no means you’ll make more money. Instead, chances are you’ll end up losing money that could have gone into marketing that generates far greater results. Sure, buying fake likes isn’t expensive. But unless you want to have a low number of likes on one post and thousands on another – and get instantly caught, you’ll have to buy them time and time over for every post you make. It’s like a downward spiral that is difficult to get out of. At least with your honour intact. Remember that Instagram is actively banning fake accounts, which will lead to you losing many of the likes you buy in a not too distant future. You might believe the opposite, but it’s actually true! 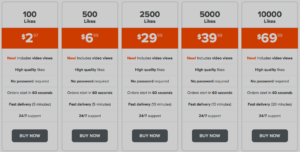 Those who are experienced with Instagram will quickly be able to tell that you are buying fake likes. And they’ll laugh at you. But getting laughed at isn’t the worst part. Your Instagram account works as a marketing pillar that reflects your brand and your values. Well, what does you buying fake likes indicate to people? That you’re a fake company what fakes popularity? What else do you fake? This is the signals that you are sending to people when you are buying fake likes. Whether it be to your customers, to potential partners, or investors, it will speak very clearly about your brand. Is that the way you want people to see your brand? Trust is the single most important thing to driving a sale, and if not even your Instagram numbers are trustworthy, how will people be able to trust anything you say? On the surface, buying fake Instagram likes might be a good idea to help you boost your engagement and present your brand as more popular. However, when studying the case closer, that ends up not being the case. In fact, it will do far more harm than good. Fake likes will cost you money, not earn you money. Fake likes will harm your social media presence, not strengthen it. Fake likes will decrease your trust, not build it. Bottom line is, don’t buy fake followers on Instagram. Save yourself money and effort and focus on things that will be more beneficial for you long-term such as creating appealing visual content or strengthening your social strategy. Have you bought likes on Instagram? What convinced not to do it or what convinced you to do so?